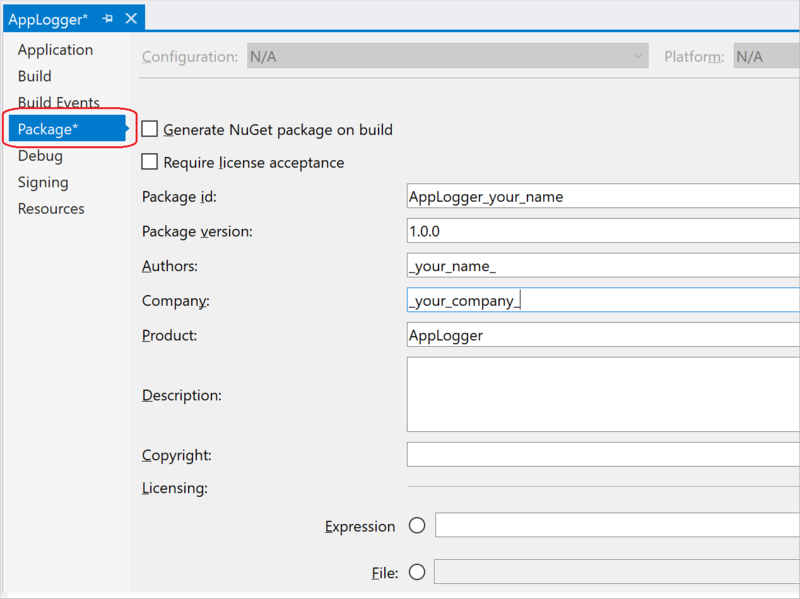 It's a simple process to create a NuGet package from a .NET Standard Class Library in Visual Studio on Windows, and then publish it to nuget.org using a CLI tool. This Quickstart applies to Visual Studio 2017 for Windows only. Visual Studio for Mac does not include the capabilities described here. Use the dotnet CLI tools instead. Install any edition of Visual Studio 2017 from visualstudio.com with any .NET-related workload. Visual Studio 2017 automatically includes NuGet capabilities when a .NET workload is installed. Install the nuget.exe CLI by downloading it from nuget.org, saving that .exe file to a suitable folder, and adding that folder to your PATH environment variable. Alternately, if you have the .NET Core SDK installed, you can use the dotnet CLI. Register for a free account on nuget.org if you don't have one already. Creating a new account sends a confirmation email. You must confirm the account before you can upload a package. 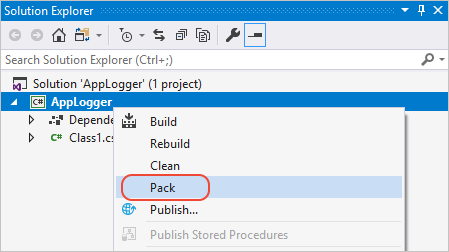 In Visual Studio, choose File > New > Project, expand the Visual C# > .NET Standard node, select the "Class Library (.NET Standard)" template, name the project AppLogger, and click OK.
Right-click on the resulting project file and select Build to make sure the project was created properly. The DLL is found within the Debug folder (or Release if you build that configuration instead). Unless you have a reason to choose otherwise, .NET Standard is the preferred target for NuGet packages, as it provides compatibility with the widest range of consuming projects. For packages built for public consumption, pay special attention to the Tags property, as tags help others find your package and understand what it does. Give your package a unique identifier and fill out any other desired properties. For a description of the different properties, see .nuspec file reference. All of the properties here go into the .nuspec manifest that Visual Studio creates for the project. You must give the package an identifier that's unique across nuget.org or whatever host you're using. For this walkthrough we recommend including "Sample" or "Test" in the name as the later publishing step does make the package publicly visible (though it's unlikely anyone will actually use it). If you attempt to publish a package with a name that already exists, you see an error. Optional: to see the properties directly in the project file, right-click the project in Solution Explorer and select Edit AppLogger.csproj. Set the configuration to Release. Visual Studio builds the project and creates the .nupkg file. Examine the Output window for details (similar to the following), which contains the path to the package file. Note also that the built assembly is in bin\Release\netstandard2.0 as befits the .NET Standard 2.0 target. The package can then be found in the bin\Release folder. For additional options with msbuild -t:pack, see NuGet pack and restore as MSBuild targets. Once you have a .nupkg file, you publish it to nuget.org using either the nuget.exe CLI or the dotnet.exe CLI along with an API key acquired from nuget.org. Virus scanning: All packages uploaded to nuget.org are scanned for viruses and rejected if any viruses are found. All packages listed on nuget.org are also scanned periodically. Packages published to nuget.org are also publicly visible to other developers unless you unlist them. To host packages privately, see Hosting packages. Sign into your nuget.org account or create an account if you don't have one already. Select your user name (on the upper right), then select API Keys. Important: Save your key in a secure location because you cannot copy the key again later on. If you return to the API key page, you need to regenerate the key to copy it. You can also remove the API key if you no longer want to push packages via the CLI. Scoping allows you to create separate API keys for different purposes. Each key has its expiration timeframe and can be scoped to specific packages (or glob patterns). Each key is also scoped to specific operations: push of new packages and updates, push of updates only, or delisting. Through scoping, you can create API keys for different people who manage packages for your organization such that they have only the permissions they need. For more information, see Introducing scoped API keys (blogs.nuget.org). This step is an alternative to using dotnet.exe. Change to the folder containing the .nupkg file. This step is an alternative to using nuget.exe. Errors from the push command typically indicate the problem. For example, you may have forgotten to update the version number in your project and are therefore trying to publish a package that already exists. If you're using a valid API key that you just created, then this message indicates a naming conflict, which isn't entirely clear from the "permission" part of the error. Change the package identifier, rebuild the project, recreate the .nupkg file, and retry the push command. And that's it! You've just published your first NuGet package to nuget.org that other developers can use in their own projects. On nuget.org, select your user name (upper right of the page), then select Manage Packages. Merely adding the readme.txt at the project root will not result in it being included in the resulting package.